Have you ever played that old children's game where you have to unscramble a word or phrase and hopefully get a perfect score by using all of the letters to make another word or phrase and even better, a word or phrase that relates somehow to the first? Well, most nerds have. About an hour ago, I was asked on a whim to unscramble the word 'Shakespeare', who was himself somewhat of a nerd. Well, try as I might I could not get that perfect score, but I did notice almost immediately that it comes amazingly close to spelling what just so happens to be one of my favorite new Canadian words ~ 'Harperspeak'. I kid you not. And if that seems somehow inconsequential, keep in mind that both of these men are considered by many, to be nerds but that each has found a unique way to use language to dominate the conversation in their own sphere. 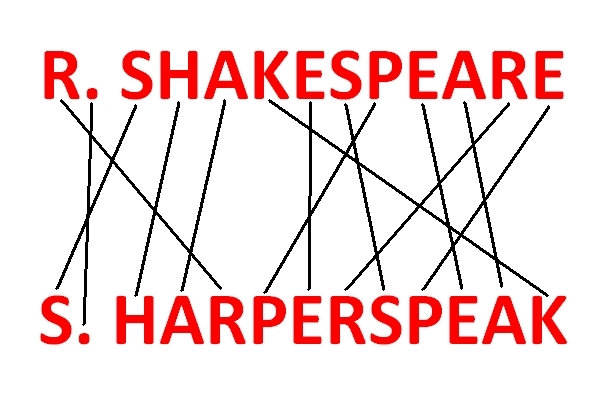 Shakespeare has influenced the language throughout the entire English-speaking world, with his brilliant use of phrase and neology and Harper has become the master of tricky and nebulous word games and ideology right here in Harper Land. W. Shakespeare used great and innovative language to say great and interesting things. S. Harper uses manipulative language to make what are otherwise obviously bad ideas seem reasonable, and to some who do not play or understand the game, he makes those bad ideas sound great. Therein lies the origin of the word "Harperspeak" ~ a word which signifies Stephen Harper's very personal form of Neo-Con propaganda. Let me be clear..... (I couldn't resist) I am forcing the issue to make a point. And if you were to do the exercise at the top of the post, you would soon discover, as I did, that there are one too many 'S's and one too few 'R's and an 'E' that would need to be a 'P'. So, an honest man would have to admit that it cannot be done and declare: "All bets are off", and look for a better solution to the puzzle. Then again, this experiment is about great wordsmiths, and propaganda after all, so I am going to use some of that famous Harper Conservative rhetoric that has become all the rage in Canada lately and cheat a tiny little bit. I will make that square peg fit that round hole yet. Just like Harper would do. Any Neo-Con worth even half of the huge amount of tax money he wastes, has managed to develop and even, in Harper's case, to perfect the habit of changing a few small facts to fit the message that he wants to promote and pass it off, no matter how ridiculous, no matter the real evidence, as the truth. So, let's imagine that William Shakespeare was really named Richard (a small lie, really) and try it again! Oh, that is so much better. In fact it is now Perfect. Or at least it would be if that pesky last 'E' had not mysteriously and inexplicably become a 'P'. So how do we explain all that away in order to make this lie seem somehow true? Let's simply pretend that we can justify the 'E' to 'P' issue as if it were signifying a transformation from great 'English' to great 'Propaganda'. Yeah, yeah, that's the ticket. And now that Mr. Shakespeare is known as Richard, the ruse is entirely complete. After all, that would, at least as far as I am concerned, make them both nerds, both wordsmiths, both famous and both now Dicks. You may very well be the coolest blogger I have ever had the pleasure of reading. All of it rings true. I spent about 6 hours reading this yesterday, and when I wandered back, you hit me with this! In a more perfect world we would all see that "vacuous dolt" (one of my favorites, Lol!) Harper through your eyes. Thanks for helping to open mine.